If your website is your virtual storefront, then your packaging of orders needs to be just like a retailers shopping bag – it needs to show off your brand. In other words, a plain parcel isn’t good enough if you want to be noticed – look at how much ASOS deliveries stick out in the post. You want prospective customers to look at your parcels and think about your business. Brand up your packaging with your logo on a sticker or an address label to make your deliveries look extra professional and personal. You’ve acquired online customers and you’re sending out their orders. So how can you utilise this to bring in potential new customers? Savvy retailers will send promotional marketing messages on leaflets for existing customers to give to friends and family as a special introductory referral offer. This encourages people to talk about your product and brand, and you can also reward existing customers for referring newbies with a special code for them too. It’s a win win situation! Show customers some extra love to improve customer experience by thanking them for their purchase. A personal note on a compliment slip in their order will engage customers, it’ll show you’re genuinely grateful they’ve shopped with you and that you’re committed to them. Whether you’re saying “hello”, “thanks” or “please stop by again’, team your compliment slips with matching business cards and letterheads for the ultimate business stationery trio. With so many print options, you don’t want your delivery ending up looking like you’ve flyered your customer. 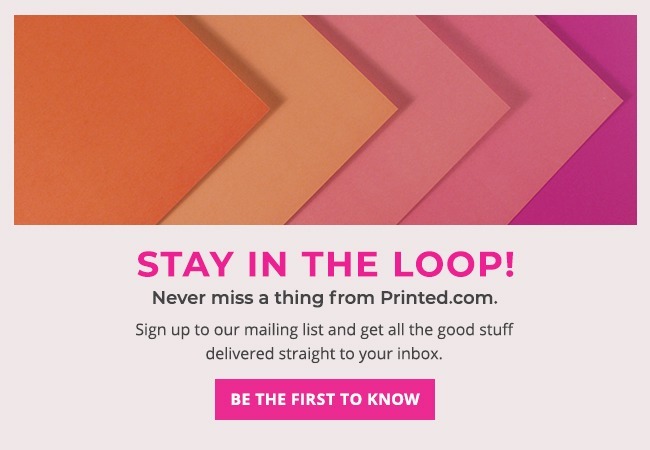 We’d recommend including your print materials, but in an orderly fashion. Slip your leaflets, business cards or thank you notes into a saddle stitched catalogue and keep everything organised, so the print doesn’t detract from their exciting delivery, and maximise future sales with the catalogue. People don’t like waiting a while for their purchase, so when they receive your goods, you’ll be remembered for making it a real experience. Make your packaging a little more luxurious with wrapping paper or tissue paper encasing your items, and pop your personal note or marketing materials in a prestigious envelope to seal the deal. You can even add an envelope liner adorned with your logo to really make receiving goods from your online shop a real treat. Let us know if your business is online, and how you utilise print as we are always keen to hear new ideas! these ways are vary valuable and helpful for me and my team. excellent advice and suggestions, any plans to offer printed tissue paper to your range? Absolutely agree – extending the branding to the outside of the envelope has brought me a number of positive comments about packaging. Ordering online is like buying yourself a gift, so I always like to tuck in a little extra something (eg designed postcard) to amplify that feeling. Who doesn’t like nice surprises? P.S. Would also like to second the request above for printed tissue paper – that would be awesome! Tissue paper would be amazing! Totally agree that brand continuity is key! Yes to tissue paper! Please!